And what a lovely scarf it is going to be! Nice choice. Good luck with those hexipuffs. I don't think I would have the patience to get started on those. They are rather lovely though. Nice colours. Thank you! Well, they are more like a side project. 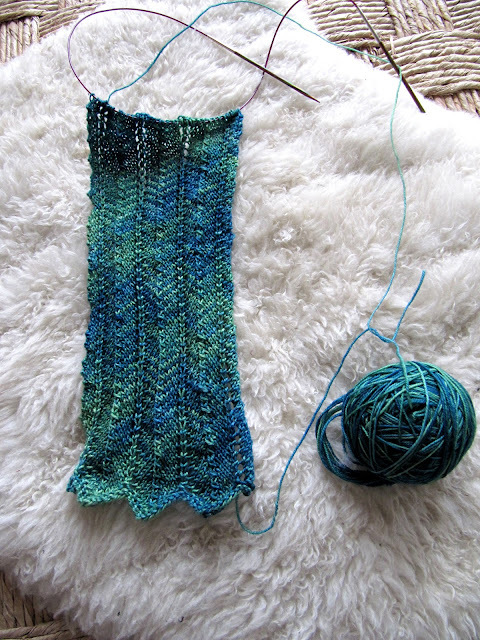 Always another project on the needles that can be finished quickly haha. Gorgeous scarf, it looks so beautiful and delicate. I love your hexipuffs, that disco dip one is fantastic!! Like a perfect cupcake topper! Yeah, I have a thing for food I guess hahaha. I love discodip on my icecream. O O O ek kan nie wag vir my Malabrigo nie!!! Jou serp gaan baie mooi lyk. Hahaha, ben benieuwd wat jij van je wol maakt. Can't wait to see. Love disco dip hexipuff it's just so cute. Ooh, je sjaal wordt mooi! Ik denk dat het een goede combinatie is, dat patroon met dat garen. Mooi! En je discodip hexipuff is echt te leuk. Nee het is helemaal niet moeilijk! Ik heb de steken die ik niet wist (DD = Double Decrease) even op youtube opgezocht. Was eigenlijk kipsimpel haha. Your scarf is beautiful! The hexipuffs are so cute! I love the disco dip one. Such a gorgeous scarf, and I can see why you'd want to make something that you can show off using that yarn - almost too pretty to be socks! What a beautiful scarf. Do you think the pattern would be suitable for a beginner? I have knitted a couple of hats and know how to knit purl, and increase and decrease ( sort of). I think you're wise to use your Malabrigo for a project that won't be so hard worn. It's a gorgeous yarn but it wouldn't be my first choice for socks. Lovely scarf! !! I LOVE the hexipuff pictures! Dippin' Dots!!! That is so awesome words don't go. ^O^ nom nom dippin' dots!! Also, way to remind me I haven't knit a hexipuff this YEAR. Love your scarf, the colour is great! Also, beautiful new puffs - especially the disco dip one, the image matches it perfectly! I love your hexipuffs along with the inspiration pictures! The scarf looks great.